Let your fashion fantasies take flight! 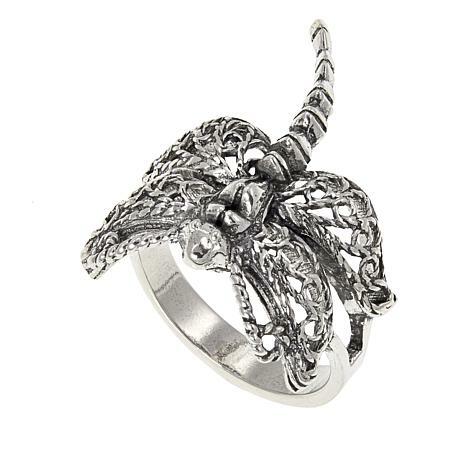 Light and artisan-crafted, this dragonfly will create a buzz everywhere you go. 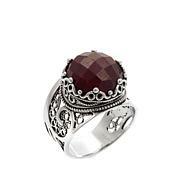 Whether you combine this ring with other accessories or let it fly on its own, it's destined to become a favorite. This ring is perfect! 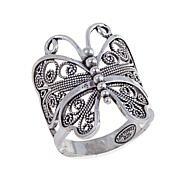 Filigree does not detract from the dragonfly. Dragonfly seems sturdy and not delicate or pliable. Purchased size 9, fits my index finger exactly as expected. The tail is not flexible and does not sit closely or flatly. A lover of dragonflies for their symbolism. Been looking for one I would love wearing and this one is unique, solid, bold, yet not itty-bitty. A perfect symbol to look down on as a reminder of a perfect transformation! 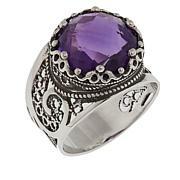 I have several of the Ottoman filigree rings, but this one is my very favorite. It is so pretty. It is a nice size--not too small, not too big. It goes with everything. If you, too, like to collect dragonflies, it is a must. Beyond my expectations ! I ordered a size 9 to wear on my Middle finger . I was holding my breath when this Beauty arrived and It fit ! The detailing in the Dragonfly is just amazing. Well worth buying if you are a Nature Lover . 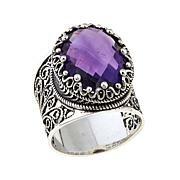 Really like this ring. The only concern I have is the tail getting hooked on something and becoming bent or breaking off all together. Thinking about purchasing one for my sister.